HIGHLANDS  The canals and reservoirs throughout East Harris County are a vital part of the industrial scene, serving the fresh water needs of refineries and industry in the Baytown area, according to the executive director of the San Jacinto River Authority, Jace Houston. 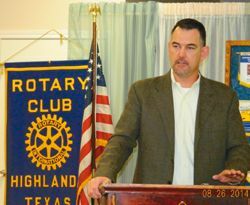 Mr. Houston was speaking to the Highlands Rotary club at their weekly luncheon on August 26. He said the Authority celebrated its 75th anniversary in 2012, having been formed in 1937. Originally, the East Canal and the West Canal were built by the U. S. Government during World War II. The SJR Authority is a state agency, and all its water is owned by Texas and controlled by the state. There are 10 major water authorities in the state of Texas, and the original legislation to control water distribution dates back to 1918, Houston said. There are 30 miles of open canal in the system, with gates, pumps, and siphons to help the distribution. Highlands Reservoir is 5 to 10 feet deep in some areas, and at grade in others. Its size is about 1400 acres, northeast of Highlands. Water is furnished to customers such as ExxonMobil, ChevronPhillips, municipal utility districts such as Newport, and irrigation farms, such as turf farms. The Authority employes 8 people in Higlands, and overall has 150 employees. They have offices in Highlands, Lake Conroe, the Woodlands, and an office known as GRP for ground water reduction plan, with the goal of providing more surface water and recycled water. Presently 140 utilities are working with the GRP. The distribution system of canals uses what are known as siphons to allow the water to pass under existing roadways, rail lines, and other canals. The San Jacinto River Authority is a government agency whose mission is to develop, conserve, and protect the water resources of the San Jacinto River basin. Their jurisdiction includes the entire San Jacinto River watershed, excluding Harris County, which is controlled by the City of Houston. The Authoritys primary purpose is to implement long-term, regional projects related to water supply and wastewater treatment. The Highlands division delivers raw water from Lake Houston and the Trinity River. It delivers more water each day than all of the other SRJA divisions combined.